Whenever we develop any asp.net application error occurs when ever we perform some unwanted operation. So in this application I will show you how you can develop a custom error page when ever some error occurs user will automatically redirected to the custom error page in your ap.net application. In this tutorial I will give an example by using C#.Net. Some of my previous Asp.Net articles are as follows : jQuery DateTime Picker Calender In ASP.NET MVC | How To Access jQuery DateTime Picker Calender Value in MVC Controller , Random Row With LINQ To SQL Using C#.Net | Randomly Select Records Using Linq to SQL Using C# , Merge two datatables in C#.Net and VB.Net | How to merge multiple datatables using C#.Net , How to create a Xml Document Programmatically Using C#.Net . Please have a look of eBooks of asp.net to free download: Free Download ebook - Mobile ASP.NET MVC 5, Designing Evolvable Web APIs with ASP.NET, Beginning jQuery 2 for ASP.NET Developers - Free download ebooks . 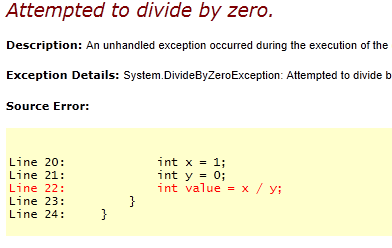 In above code we are dividing a number by zero, this operation is not allowed in c#. so when we execute the page on that case we will get below mention error. Now we will put a custom error page. For this we will create a custom error page(error.aspx) and make some changes in our web.config file. 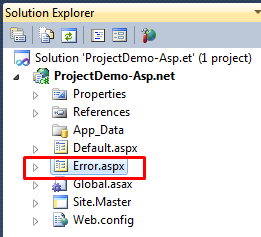 In above code we have added an error.aspx page this page will be displayed when some error will occur. Now run the application. You will get the below mention error and after error you will not get above mention error page. You will be automatically redirected to error.aspx page.